Hispanic | Let us be sweethearts. The history of the United States has generally taken a British-centered approach. Other inhabitants, have often been simply a foil for the story of the British, and later American, conquest. In Presidio, Mission, and Pueblo, James Early endeavors to fill in the missing history of the Spanish and Hispanic occupants. 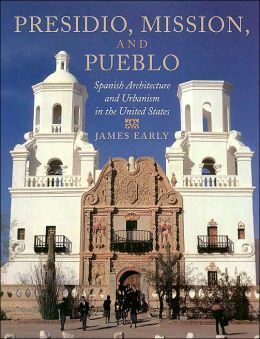 His account is extremely detailed and provides not just a study of buildings and construction techniques, but is, in fact, a truly anthropological view of the period from 1526 and the first Spanish settlement of San Miguel de Gualdape, through to the occupation by American forces in 1846. As Early points out, this is a length of time greater than that from the American Revolution to the present day. Early begins with an overview of the development of Spanish settlements on the mainland. Following the instructions laid out for the West Indies in the “Ordinances of Settlement”, water-front development required a town square built at the head of the port, with the central church facing the water. In-land settlements were to be designed around a central square containing the church. Without water to restrict growth, the settlement would radiate out from the square. The remainder of the book is devoted to the Spanish settlements, organized by modern U.S. State and, within each state, by region. Florida, with early settlements up the coast, is the first state. Early explores the reasons for the development of St. Augustine as the regional capital (not the first choice of the adelantado for the region). He further explicates the process of constructing the city, the Caribbean influences to the stone and shell-concrete construction, and the dangers of attacks that demanded it become a heavily fortified town. He moves on into the area of present-day New Mexico, where native Pueblo construction techniques were preferred, due, in part, to the lack of masons or engineers versed in any other building styles. It is as Early moves into the West that the Spanish Mission system becomes the driving force behind the architecture. Whereas St. Augustine, a cosmopolitan city with ties to the Caribbean, attracted many settlers, few Spaniards were interested in the hinterlands of New Spain. This led to missionaries, intent on the conversion of native peoples, and soldiers (to protect the missionaries), being the primary inhabitants of these regions. The structures in Texas, Arizona, and California best exemplify this history. Possessed of well-trained military engineers and masons from Mexico, the missionaries in these regions guided the construction of large churches made of stone and wood, with vaults and soaring arches. The structures, usually covered in white stucco, look simple and humble from the exterior, but are often filled with wooden and stone sculptures and paintings in a riotous array of colors. Insightful and expansive, Early’s book should be read by anyone interested in a fuller exploration of architecture and culture in the United States. Discovering family secrets is the theme of these two books I recently read. In Annie’s Ghosts: A Journey Into a Family Secret, Steve Luxenberg finds out that his mother, who had always claimed to be an only child, in fact had a sister who was physically disabled, and apparently mentally challenged (although whether she had a mental disability or psychiatric illness is unclear from all of the records Luxenberg found). This sister, Annie, was institutionalized in the 1940’s…whereupon Luxenberg’s mother began to deny she ever existed. Luxenberg only discovered her existence after his mother’s death, and began his quest to discover all he could about this aunt he never knew, and why his mother had denied her for so many years. Luxenberg’s writing is powerful and he looks at the facts with an unflinching eye. We are taken on a tour of the system of institutionalization of those deemed “different” from society, warts and all. The hunt for information of this kind is so elusive, we feel this in the writing and cheer every scrap of information, just as Luxenberg must have when he came across it. We also tour the impact on Luxenberg’s mother. Why precisely did she hide the fact of her sister? And why persist in the lie, even after she buried her next to her own parents? These are not questions with easy or ready answers, but Luxenberg handles them with grace and deep insight. 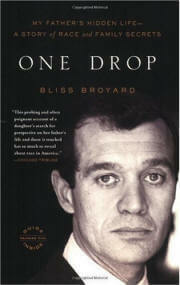 Bliss Broyard, daughter of long-time New York Times literary critic, Anatole Broyard, grew up in a very WASPy enclave of Connecticut in the 70’s and 80’s. As her father lay in a hospital bed, dying of prostate cancer, her mother asked, begged him to tell his children about his secret. He couldn’t bring himself to it, and so Alexandra, wife of Anatole and mother of Todd and Bliss, was forced to tell them that their father was a “colored” man. A New Orleans Creole of mixed heritage, Anatole’s family had moved to escape the segregation and daily humiliations of being black in the south when he was just a boy. Very light skinned, Anatole began to “pass” when he was in college in the 1960’s. It was an open secret among his friends, and he did not go around proclaiming that he was white, he just never corrected others when they assumed he was. Moving to Connecticut with his wife and babies, the very pale and blonde Todd, and the pale brunette Bliss, cemented his break with self-identification as anything other than white for the rest of his life. One Drop: My Father’s Hidden Life–A Story of Race and Family Secrets follows Broyard’s quest to discover her heritage, her hidden family, and the reason’s her father chose the path he did. Broyard visited New Orleans, Los Angeles, and New York’s Bed-Stuy neighborhood, hunting down the bits of information that tell the story of her father’s life. She finds family, some who also call themselves white and some who consider themselves black. She also finds the double secret that several of her family antecedents, Creole’s themselves, owned slaves during the antebellum period. The book is unsentimental and Broyard manages to present everyone involved in the story as they are, trying to understand their decisions without condemning them. It’s a story which is familiar in many families…whether they know it or not. In an interesting end note, some Broyard family members submitted their DNA for ancestry analysis…and discovered that they have mostly European and American Indian blood, with a small “drop” of African ancestry. What this means in this day and age, when we are often declared to be “post-racial”, is perhaps a subject for another book by Broyard. My own family background, very light-skinned Puerto Rican, has interesting reflections in this story. I have cousins who are red-haired and blue eyed, and cousins who look quintessentially “Hispanic”. I’ve often been told that I don’t look “Hispanic”…whatever that means. In another era, would I too have “passed”, or would I have embraced my ethnic heritage? Am I “passing” now, when I can walk through stores without being followed if alone, but am tracked like a criminal when with my mother, who speaks Spanish and English interchangeably as we shop is with me? Is it strange to me that, while I recognize the likelihood of having Native American and African antecedents in my family, I receive the benefits of living in an American society that still views lighter skin as better than dark…unless it’s a tan? Lot’s of interesting questions raised by these two books. What are the hidden skeletons in my family closet? How is Grad School Like Being Dead?